The log home is located on the West shore of Newfound Lake in the town of Hebron, NH. It is situated down a private dirt road in a protected cove. 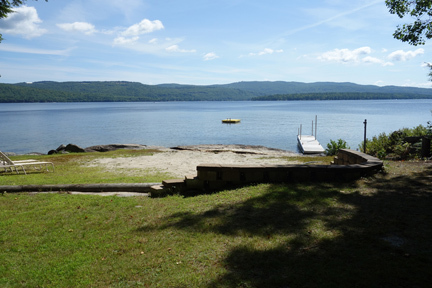 The view from the beach area is looking at the widest part of the lake in a very peaceful and quiet part of the lake. This is an all season spacious vacation log home near the water's edge. Newfound Lake has been referred to as New Hampshire's best kept secret and is known for excellent trout and bass fishing. This is an excellent location for swimming, fishing, canoeing, kayaking, hiking and winter skiing, ice fishing and snowmobiling. This glacial lake is a beauty in the middle of New Hampshire and is 2.5 miles wide and 7 miles long, reaching depths of up to 180 feet, with 22 miles of shoreline. The water, fed by eight springs, is considered the most pristine in the state. The Lakes Region of New Hampshire is such a wonderful vacation spot for so many people year after year. 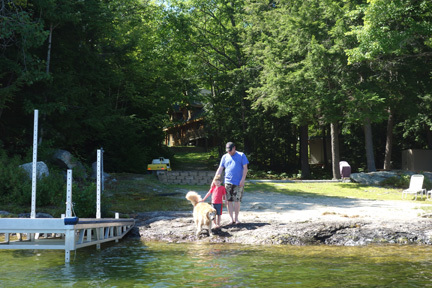 Newfound Lake is a special place known as New Hampshire's best kept secret. You will experience the best part of Newfound Lake which is not commercialized and still a lot of natural beauty like years ago. Many families are second and third generation owners. Newfound had many camps years ago. The greatest impact on Hebron from the establishment of these camps, especially the ones that survive to this day, was unintentional. Large areas of shoreline and many acres of surrounding land have been kept in natural condition because of these camps. Further, in several cases, the land is now locked away in perpetual trusts that insures that these many acres remain forever wild. Between 1925 and 1945 tourism was a full blown industry at Hebron. The great camps that owned so much of the lakeshore on the north end kept the tourism activities and population density in Hebron much lower than that on the south end. This is still true today. Whereas, cottages and bungalows dotted the southern half, the northern half of the lake was limited to campgrounds, inns and private camp complexes. We are blessed to be in this special part of Newfound Lake!